Tub Size: 71.25" x 34.75" x 24"
Bottom Interior: 46" x 24"
Before ordering or installing, please consider future access to equipment. • When ordering an air bath, the air blower must be remote mounted. • If tub is equipped with Chromotherapy, the control box must be remote mounted. of waste and overflow. 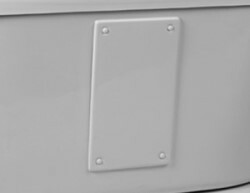 If the tub will be viewable from all angles, MTI will upon request eliminate the access panel. Please note, installation will be slightly more difficult. Since 1988, MTI Baths has earned a reputation for impeccable quality, innovation and unique customizations for its expansive line of bath products. MTI offers fine products in acrylic, engineered solid stone and wood, all manufactured with care in the USA. MTI is distinguished from its competitors by the incredible degree of customization that is offered. While preconfigured packages are readily available for ease of ordering, at MTI these are not a limitation but only the beginning. Because each product is built to order, additions, deletions and modifications to equipment levels and placement can be made, providing the customer with unparalleled customization and a truly personalized product.